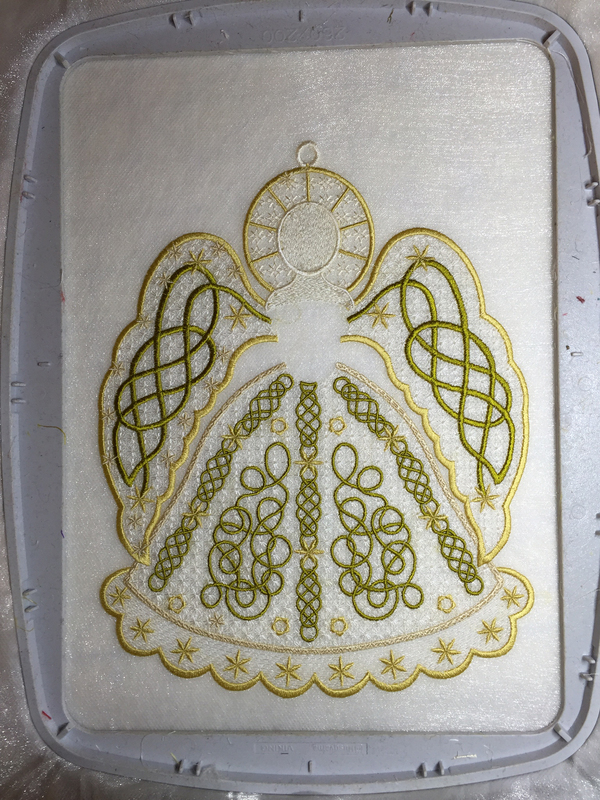 My Celtic Angel is finished and here is one of my angels sitting on the embroidery unit of my machine. With all the designs in this set you can customise your very own angel. 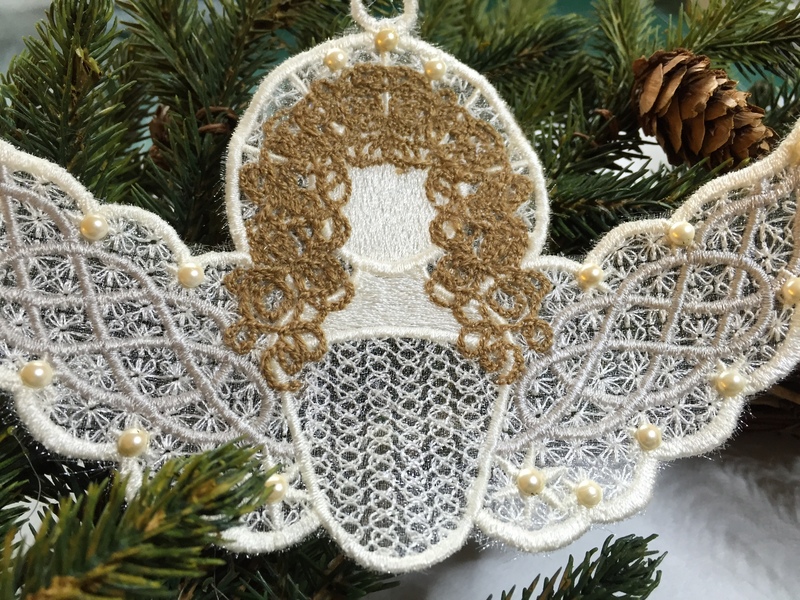 Add Madeira Lana hair as shown in this upper angel hanging on my tree. I love the off white version here and think the little pearls finish it off nicely. 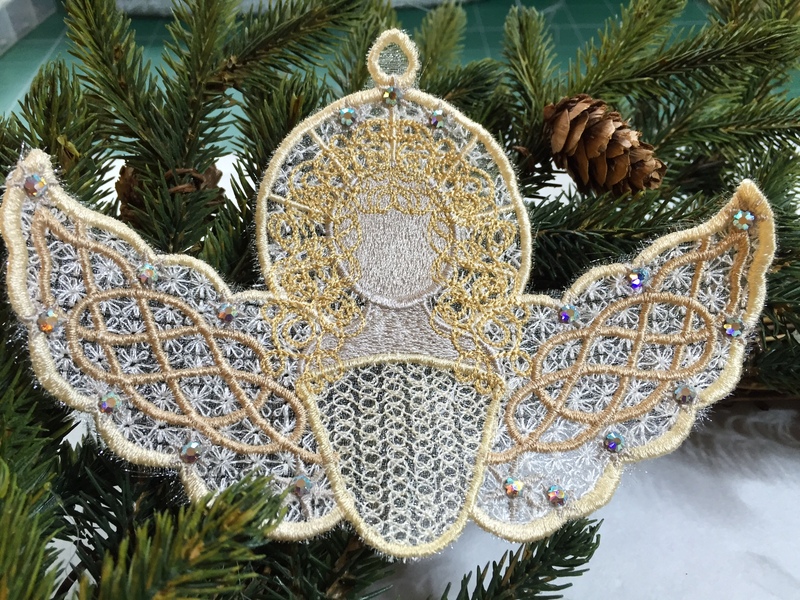 The designs in this set enable everybody with the 5″ by 7″ hoop and larger to create their own unique angel, flat or with a full skirt to sit on the top of the tree. Last weekend I created a different pair of wings which are larger and point downwards. This design stitches out in the 12″ by 8″ hoop and here you see my experimentation with green Celtic ribbon work and gold scallops. I used white for the face and just need to add the bodice and hair. 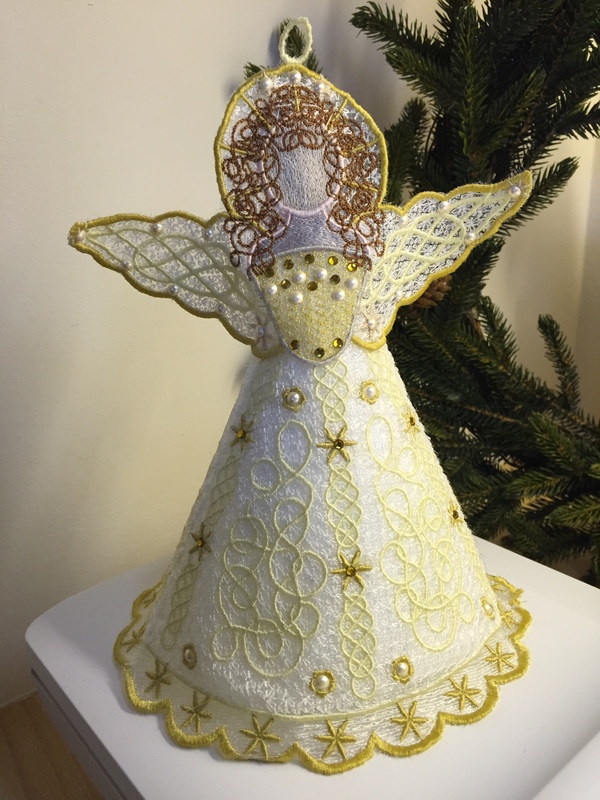 The flat version of this angel would make a superb cushion or festive wall hanging. 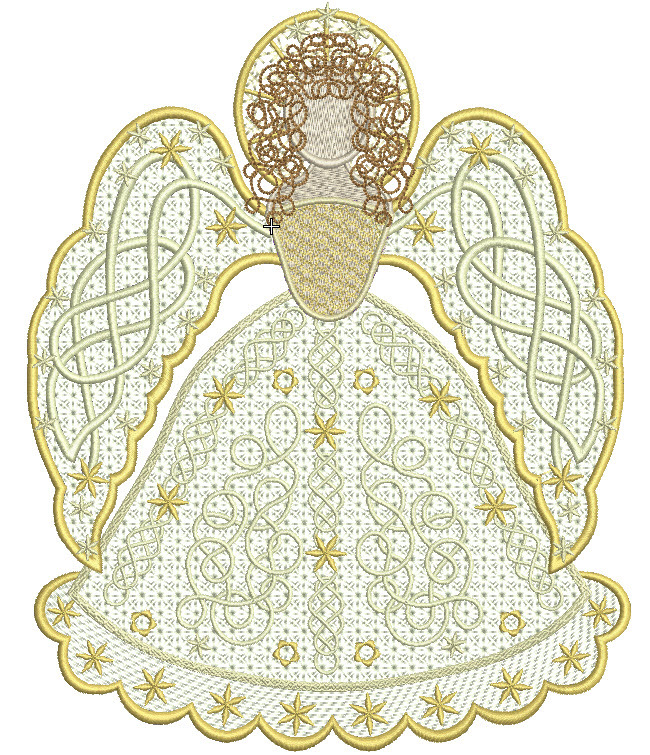 I have several more angels to embroider out and have so enjoyed deciding on the colours and crystals to use for them. You can create individual wings in the 5″ by 7″ hoop and lay them on top of each other before securing them with the centre design which has the face, bodice and hair. Outline alignment stitches (OAS) enable everything to line up successfully. There is an option for an applique bodice with or without the small Celtic stitch overlay. I think the best wings are stitched out in pale colours so they do not appear to be too heavy! Your finished angels can also stand on your mantle piece amid your greenery. 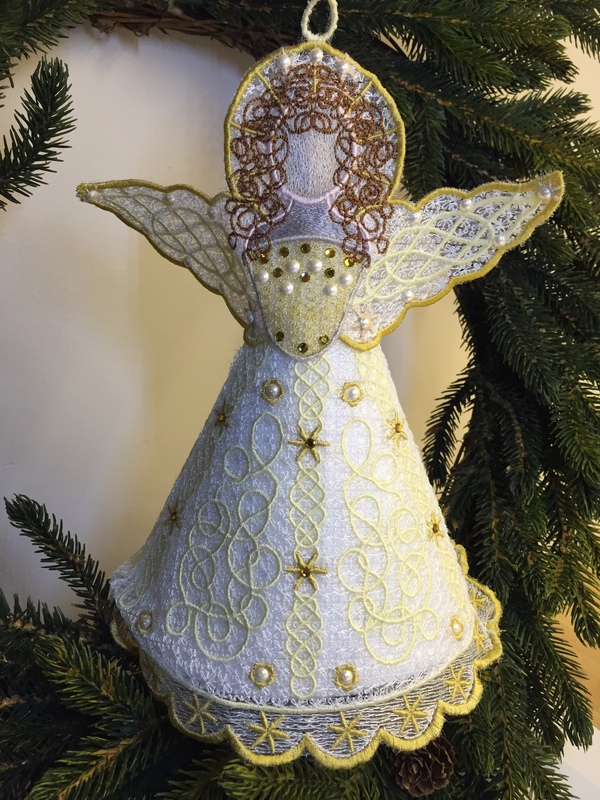 There are so many ways you can use them and I know that you will all let me see your angels and how you incorporated them into your Christmas. There are several other little decorations for your tree in this set which will perfectly compliment your angel. 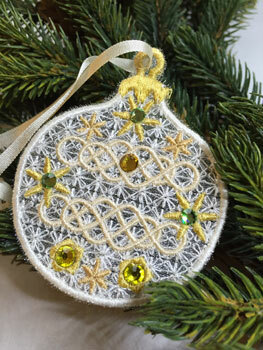 Use them for some embroidered Christmas cards! 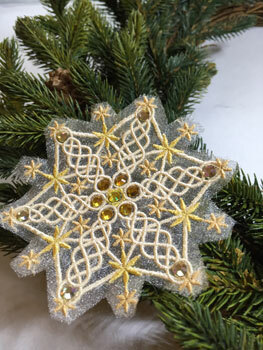 This gorgeous Celtic snowflake has been brought alive with green and topaz crystals. This smaller bauble is the freebie from the set. You will find her on my Home page at Graceful Embroidery. Just stitch it and the other designs on organza using wash away stabiliser, and then carefully trim away the excess fabric before washing out the stabiliser. I hope you have fun with this free design and the other designs which will be released tomorrow, 15th December, 2015. Watch out for my Graceful Snowflakes 2015 which will be released in a few days. 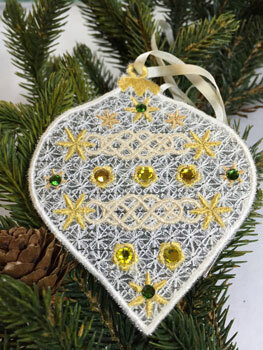 This entry was posted in Announcements, Discussing machine embroidery, Embroidery projects, New Designs and tagged Celtic Designs, Christmas, Crystals. Bookmark the permalink.